If there is one dessert I bake the most in our house, I think it is crisps and cobblers, with cookies coming in close behind! Any fruit in my house will end up in a dessert eventually. And right now- it’s triple crown blackberries! Last year, we picked a s*** load of blackberries in one afternoon. We found this really cool, uncrowded farm that grows these thornless triple crown blackberries. The three of us grabbed the buckets-on-a-string and went to town! We had picked 65lbs of blackberries in less than 2 hours! We of course canned blackberry jalapeno jam ( post/recipe coming soon) and froze about 5 gallon bags worth of berries. Well the supply has finally run out and we need to go pick more in a few weeks! 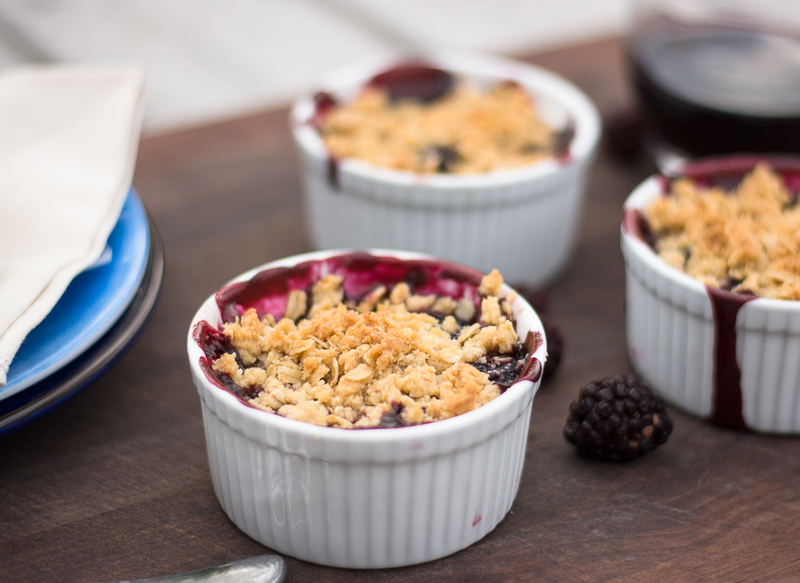 Let’s discuss this insanely yummy crumbly topping…. I adapted this recipe from the Bountiful cookbook. There are many amazing recipes in this book. Your next trip to the bookstore ( yes, these still exist) go to the cooking section, look up this book, and get ready to drool over all the beautiful photos and delicious recipes. Any baker knows that the best crumble is a mix of flour, brown sugar, salt, cold unsalted butter, and of course oats. All these ingredients baked together, melt into this crumbly buttery amazing topping for your berries. 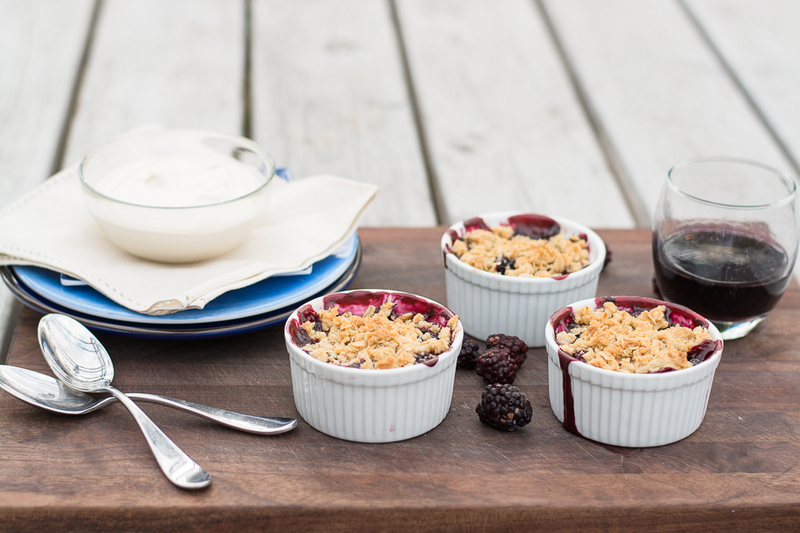 This summer cobbler is served best with a honeyed whipped cream, or if your in a pinch- vanilla ice cream will do! 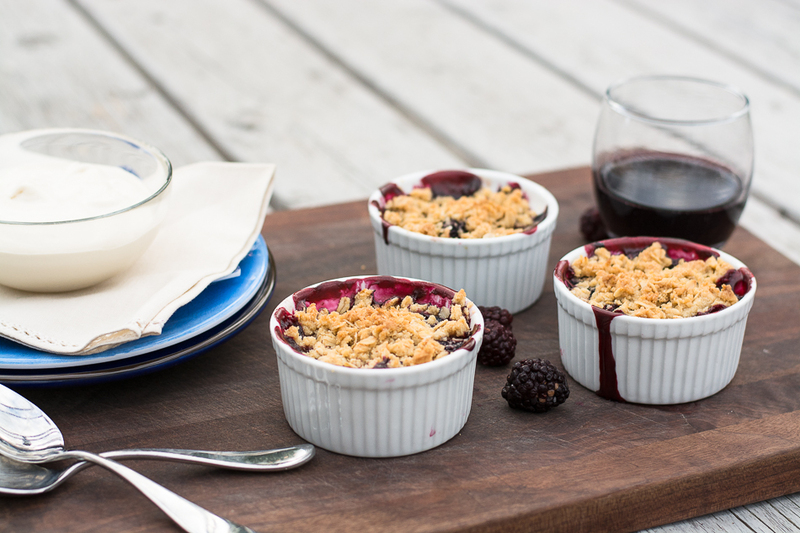 Cheers to summer, cobblers, crisps and lots of berries! Butter a 2 quart dish or smaller oven proof vessels to hold the cobbler. In a large bowl, combine all of the filling ingredients and set aside. In another large bowl combine the flour, brown sugar and salt for the topping. Cut in the butter to resemble small crumbs. Add the oats pinching with your fingers to make larger pieces of the topping. Pour filling into your dish, top with crumble topping. Bake for 45 mins until golden and bubbly. If using smaller dishes, adjust time to 20-25 minutes. 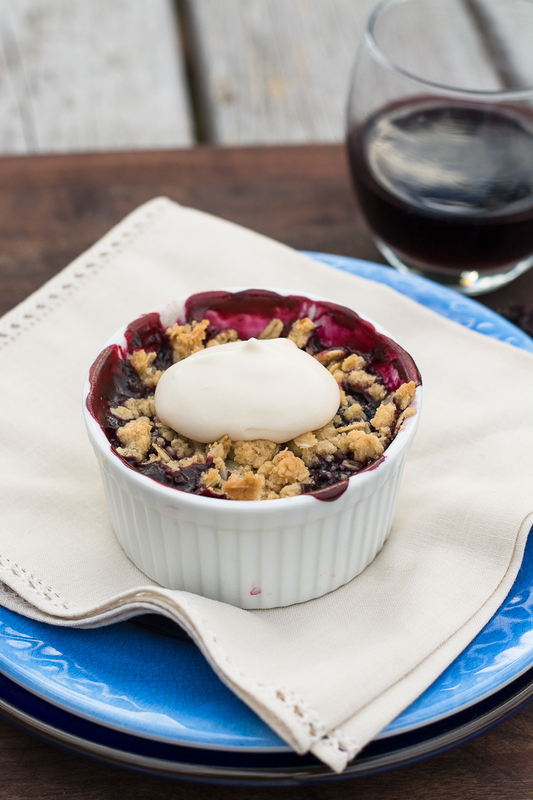 Serve with ice cold vanilla ice cream or whipped topping!